1.5 Where to buy the mattress? LUCID 12 inch memory foam mattress has mixed reviews about its feel. Some people report it’s soft and some review it’s hard. But for most customers, it holds true to its name and it’s a plush beds. That said, people who used to sleep on a soft bed will find it very comfortable. If you come from the firm bed and want a really supportive bed, go for the other version of LUCID 12″. A few customers tell it’s very colse to Tempurpedic. That may be not true for you. But it does have some features as Tempurpedic. Many owners report it works on back pain very effectively and they feel better after using it. The included bamboo cover is very nice and soft so that customers like it. Check out following paragraphs for more details. If you check out Amazon and glance over some of over 400 customer reviews, you must find some owner say it’s soft but some complain it’s not plush at all. You may be very confused and want to know who tells the truth. Actually, most customers review 12″ LUCID memory foam mattress is really a plush bed. Why some complain it’s not soft? First, Feeling firm or soft is has something to do with how many pounds you weigh. A few people under 200lb find it a little bit firm while some over 350lb feel too soft and sink in too much. Secondly, for some people, it’s the first time to own and sleep on a memory foam mattress. They don’t get accustomed to the new bed from spring or waterbed. Memory foam bed is a different type of bed from others. When people lying on it, they may not feel soft first because the bed becomes soft depending on absorbing body heat. According to all buyer reviews, 85% reported it was a plush bed and also supportive. Many owners compare LUCID 12 inch memory foam mattress with Tempurpedic mattress and say they are very close. Don’t take it serious and that only means they like it very much. Tempurpedic mattresses are using high density memory foam. It’s said that the density of their mattresses is over 5lb or 7lb. However, this bed consists of 4lb dense top foam and 3lb center foam. That’s not comparable. It’s obvious that LUCID bed is soft and the big brand is firm. Whether it’s comparable to Tempurpedic denpends on your personal preference. If you are really want to looking for a Tempurpedic type bed, this bed isn’t it but it’s really a economical comfortable plush bed. 12″ LUCID Plush Memory Foam Mattress comes with a 25 year warranty card but no contact information is available on the card. A few customers said forgot the warranty. That’s not true story. The company is standing behind their mattresses. It has a phone number 8005609239 and email address sales(at)linenspa.com. You can confirm the warranty via email or phone and they will answer every questions you ask. According to LinenSpa official reply, they offer 30 days satisfaction guarantee for all mattresses not removed from the original packaging. The manufacturer’s warranty covers defects and workmanship for up to 30 days from the date of purchase. This mattress includes a removable bamboo cover. Lots of customers mentioned it and liked it. It’s not that kind of cheap giveaway to encourage people to buy this bed.It’s a quality cover that saves you an extra hundred bucks on a new cover. 12″ LUCID mattress features 2-inch 4 pounds memory foam top, 2-inch 3 pounds center and 8-inch foam base. 4-inch overall memory foam conforms to your body and allows your lower back to be supported in the proper position, which is a common source of back pain. Back pain sufferers don’t move a lot at night to find a comfortable position to fall asleep. LUCID always sells their memory foam mattresses at a very low price. Compare to its competition Sleep Innovations, the price becomes an advantage of LUCID 12″. It’s a great deal for people who want to buy a quality 12-inch memory foam without paying 10 times money. 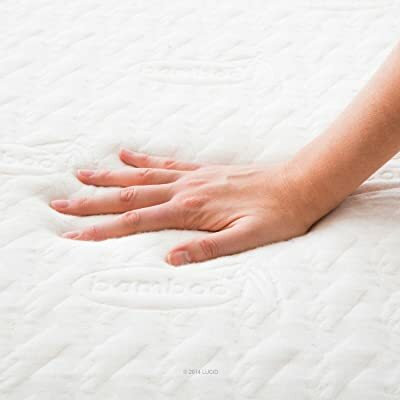 12″ LUCID memory foam has another version Gel Memory Foam which doesn’t cost much more. If you are interested in gel foam, go to check it out. This LUCID mattress also is doing well in isolating motion transfer. That said, your partner doesn’t feel you move, roll over or get out of bed at night. You don’t need to worry that your movements will disturb the other sleep. This LUCID 12-inch breathes fairly and most sleepers don’t feel overly warm on the bed. Besides the bamboo cover helps lower the temperature. But if you are hot sleeper and often sweat at night, you should get the gel version. This bed comes with a slight “new mattress” odor. If you are sensitive to the odor, leaving fans on and window open will help it dissipate quickly. Generally, the odor will be gone in a day. Hundreds of people purchased it and left their reviews out there. Only on Amazon, there are nearly 400 customer reviews. The overall rating is 4.3 stars. Over 350 owners are satisfied with their mattress. The bed is soft but still supportive enough, which makes a very comfortable sleeping experience. On the other hand, the smell dissipates quickly and doesn’t linger in the room. FYI: The mattress weighs over 80 pounds. It’s very heavy and becomes bulky after unwrapped, not easy to move into the room. You’d better put it on your frame before you open it. Where to buy the mattress?